"The Honkiest Tonkiest Beer Joint in Town"
Sportsman Tavern, located in Buffalo's "other" Polonia neighborhood of Black Rock. Working man's bar with great respect for classic country music. Owner Dwane Hall schedules some of the best bands this site of the Grand Ol' Opry. The Sportsman Tavern reminds me of many of the "honky tonk" bars located on Broadway in Nashville. Stage is close to bar, pool table in back. Note original tin ceiling. Sportsman features Buffalo's own Flying Bison Beer on tap. Hours: Open 7 days a week, Live Music 5-6 nights a week. The legendary Sportsman Tavern in the city's Black Rock neighborhood hosted their first ever polka band on Sunday, February 26th. Over 100 people crammed the legendary bar that bills itself as the "The Honkiest Tonkiest Beer Joint in Town" to hear Jerry Darlak and the Touch. After talking a year off, the Touch seemed well rested and filled with new energy during the performance. In the spirit of Mardi Gras, their rendition of "Let the Good Times Roll" had the bar rocking and the dance floor filled to capacity. "If polka music is to attract a young, new audience, it has to be featured in a small club atmosphere like the Sportsman," explained Marty Biniasz. "Sunday's performance reminded me of seeing bands in the back room of the Broadway Grill. The audience was right on top of the stage and the exchange of energy between the musicians and the crowd was electric." The Sportsman Tavern is well know to Western New York music fans for featuring county western and "rock-a-billy" style music. The tavern's house band, Stone Country, has performed for over 30 years and is featured every Thursday night at 9:30p. The band is made of Sportsman owner Dwane Hall, guitar, vocals; Carl Eddy, guitar, vocals; Paul Iannello, lead guitar; John Dieckman, pedal steel; Jimmy Sweet, bass; Randy Bolam, drums. Hall also owns Sessions Recording studio which is located next door to the tavern. With the success of last week's show, the Touch was immediately booked for a second engagement to take place on March 26 at 4pm. There is also talk of recording a live CD at the Tavern in the near future. 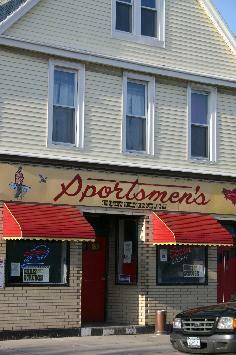 The Sportsman is located down the street from Assumption R.C. Church at 326 Amherst Street in Buffalo.